Day 8 of 68 Days of Gourmet! Only 60 more posts to go! I made an exciting purchase last night – The Gourmet Cookbook. It includes over 1,000 recipes. I started flipping through it last night and have already flagged well over 60 recipes that I want to try and that was just appetizers, soups and salads! It’s going to be tough to narrow it down but I’m happy to have this resource in my kitchen. Sashimi grade tuna steaks were on sale at the grocery this week and they looked great. I picked some up on my weekly shopping trip. I found this recipe that included an amazing looking marinade in Gourmet. The marinade reminded me of a recipe I’ve always loved that my parents use for salmon. It was just as good as I’d hoped. While cooking the tuna, I brought the marinade to a boil so we could spoon extra sauce over our fish and rice. The combination of the teriyaki and soy sauce with the fresh ginger and garlic was so delicious. I will definitely be making this marinade again for tuna and also for salmon. I usually have most of the ingredients in my pantry so it’s a great standby fish preparation. Combine everything except for fish in a baking dish. Whisk to combine. Place fish in marinade and let sit at room temp if you’re marinating for less than an hour, in the fridge if you’re marinating over one hour and bring to room temp when you have about an hour left. The reason for this is so your fish won’t be cold in the center when seared. Marinate fish for up to 2 hours total. Remove fish from marinade and pat dry. Place marinade in a small saucepan and bring to a boil and let cook for a few minutes. Heat a couple tablespoons of oil in a saute pan over medium high heat. Sear fish about 1 minute per side for rare tuna. 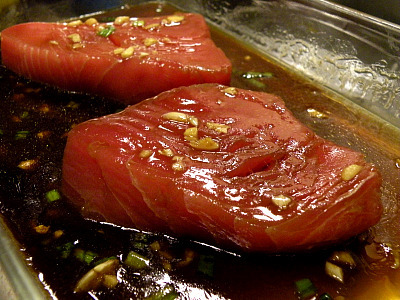 Spoon a bit of boiled marinade over tuna before serving. This was very easy to put together and I loved reducing the marinade for a sauce with the tuna. 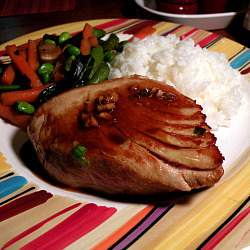 The tuna cooking directions were perfect and our tuna came out nice and rare. I was a little nervous about using a regular skillet instead of non-stick but knew that I wanted the seer. After 1 minute per side, my tuna released on its own. I will also be trying this with salmon. A keeper for sure! Yay! So glad you liked this. It was a nice new discovery for us – you know we love tuna! I also can’t wait to try it with salmon – let me know if you do and how it turns out!